Atrazine is one of the most widely used herbicides in the United States (see figure). Atrazine is applied in agricultural lands, roadsides, and turf grass in golf courses and residential lawns to kill weeds. However, it has been found in rivers, lakes, and groundwater, which are used for drinking, irrigation, bathing etc. Hence, there are concerns about the effects it could have on humans. 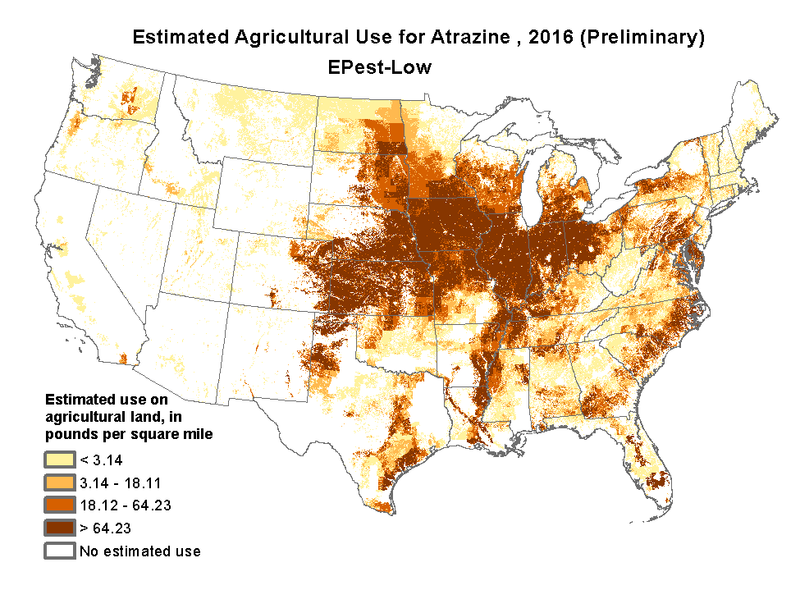 Atrazine use in the United States in 2016. Photo taken from U.S. Geological Survey website. Atrazine suppresses luteinizing hormone (LH). LH is responsible for ovulation (release of egg) in females and sperm production in males. It can also change levels of dopamine, which helps brain cells communicate, and somatostatin, which regulates the release of other hormones. Longer exposure to atrazine can lead to decreases in body weight and affect the kidneys and heart. It can also delay the formation of bones in unborn children. These effects, however, occur at a dose higher (70 mg of atrazine/kg body weight) than the one which causes hormone suppression (3mg of atrazine/kg body weight), the most sensitive effect. How much atrazine is safe for humans? To answer this, the Environmental Protection Agency (EPA) first found the lowest dose of atrazine which, when fed to rats, causes the suppression of LH. They then used a mathematical model to estimate, over time, what concentration of atrazine this dose would correspond to in the rat’s blood. The model then applied the same atrazine concentration to human blood and estimated an equivalent human dose. This is assumed to be the lowest dose that causes hormone suppression in humans. The model also estimated what the equivalent human dose would be if atrazine entered the body through physical touch or inhalation. The use of this model reduced the uncertainty associated with extrapolating animal study results to humans. As hormone levels are unaffected if rats are fed atrazine for fewer than four days, short-term effects of atrazine exposure were evaluated differently. EPA relied on studies which showed delayed formation of bones in embryos of rats and rabbits that were fed atrazine. The doses which caused this effect were divided by 10 to account for differences between animals and humans. Similar evaluations were done for the toxic break down products of atrazine. How much atrazine are humans exposed to? The EPA has measured concentrations of atrazine and similar pesticides in food crops and livestock commodities. They used this information in another model which contains data from consumption surveys (that asked for the type and amount of food consumed) of nearly 25,000 individuals in the US. The model converted any processed food into its corresponding raw agricultural commodity (i.e., vegetable, fruit, cereal grain, etc.). Thus the EPA could estimate the amount of atrazine an average American would consume through food. The EPA periodically monitors lakes, streams, rivers and groundwater for levels of atrazine. As the agency has calculated the doses of atrazine which cause negative effects in humans, it could estimate what should be the maximum concentration of atrazine in drinking water that would be safe for humans. This calculated drinking water concentration should be less than the concentrations actually observed in the EPA’s extensive water monitoring data. Studies which looked at how much atrazine transferred to cloths that were rolled on treated turfs were used to estimate how much contact exposure humans could potentially get by touching turfs. For example, if an adult had high contact with a turf that was just sprayed, the maximum dose of atrazine he/she would be exposed to was 0.7 mg/kg body weight. For children, this dose would increase to 1.2 mg/kg body weight. EPA found that the amount of atrazine that humans were consuming through food and drinking water were below levels that could cause any negative effect. However, children and adults that touched turf grass that was sprayed with atrazine were at risk. This risk could be removed if the rate of atrazine applied to turf grass is nearly halved. Once the EPA completes its final assessment of atrazine, which will also include the effects of atrazine on other organisms, it will decide whether to re-register the herbicide without any changes to its uses, re-register it by regulating its use, or cancel its registration altogether.